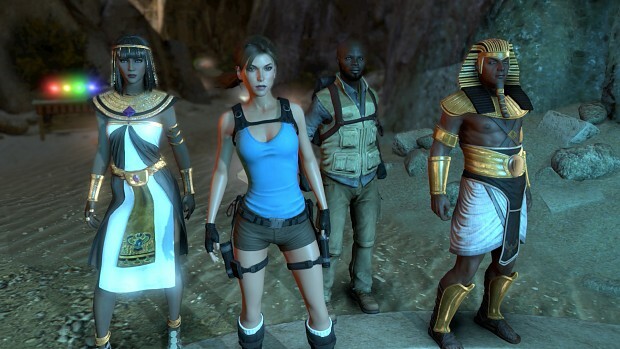 Takes place in the Temple of Osiris, hidden deep in the deserts of Egypt. Lara Croft arrives at the temple, hoping to be the first inside, but rival treasure hunter Carter Bell has beaten her to the entrance. They each seek the Staff of Osiris, but they discover more than they bargained for. Upon entering the tomb, Carter removes the mythical Staff from its resting place and inadvertently triggers a trap cursing them both and unleashing the evil god Set. But the staff also awakens the gods Horus and Isis, the son and wife of Osiris. Now free from their ancient prison, they join forces with Lara and Carter in order to resurrect Osiris, the only god capable of removing the curse. As Lara and her companions fight their way across the sands and through ancient tombs, they will face gods and monsters of myth and legend. With the fate of the world at stake, Lara must uncover the fragments of Osiris to stop Set from enslaving all mankind.